Welcome to the Shrine of Our Lady of La Salette Website. We are Traditional Roman Catholics dedicated to promoting the True Faith. We are located in the beautiful City of Winter Park, Florida. Visit us as we update our site with Mass schedules at Traditional Catholic Churches throughout Florida, Catholic calendar events, Sacraments, contacting a Priest, assessing Traditional Catholic content and related sites, and news of our FREE Food Program for the needy. 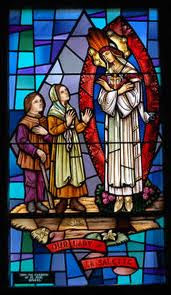 We place the Shrine of Our lady of La Salette under the protection of Saint Michael the Archangel. He has been especially honored and invoked as patron and protector by the Church from the time of the Apostles. Unfortunately, in these perilous times of apostasy in the Vatican II Church, Saint Michael has been virtually dethroned. 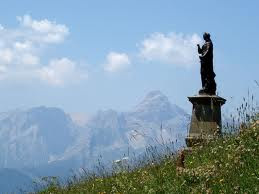 They removed his statues and pictures and eliminated the Saint Michael prayer ordered by Pope Leo XIII to be said kneeling after the Celebration of the Mass, along with the Hail Mary prayers, Salve Regina, and other prayers. When Saint Michael, protector of the Church was removed from the Vatican II Church, he became unable to protect their Church? The result: The smoke of Satan entered and flourishes--BIG TIME! Well, here at the shrine of Our Lady of La Salette, we do not eliminate Saint Michael--we honor and invoke him to be our protector and defender. 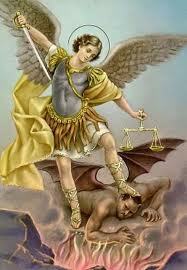 St. Michael the Archangel, defend us in the battle. Be our protection against the wickedness and snares of the devil; may God rebuke him, we humbly pray. O Prince of the heavenly Host, by the power of God, thrust into hell Satan and all evil spirits who wander through the world seeking the ruin of souls. Amen. The Blessed Virgin Mary grants seven graces to the souls who honor her daily by meditating on her tears and dolors (sorrows). This devotion was passed on by St. Bridget. 2. They will be enlightened by the divine mysteries. 5. I will defend them in the spiritual battles with the infernal enemy and I will protect them at every instant in their lives. 6. I will visibly help them at the moment of their death. They will see the face of their Mother. 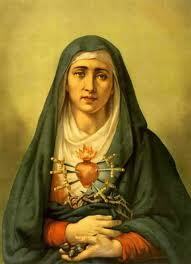 Say one Hail Mary while meditating on each Sorrow. Hail Mary, full of grace, the Lord is with thee; blessed art thou amongst women and blessed in the fruit of thy womb, Jesus. Holy Mary, Mother of God, pray for us sinners now and at the our of our death. Amen.